Thank you for your interest in Longfellow Elementary and welcome to our website. Whether you are a member of our school community or exploring Longfellow for the first time, we hope that you find our website informative, enjoyable, and easy to use. We also hope our website conveys the essence of the wonderful learning environment fostered by our dedicated teachers and talented students. Together they make Longfellow the unique and special place we believe it to be. Featured Teacher: Mr. Dinh! Click the title above to read the interview! 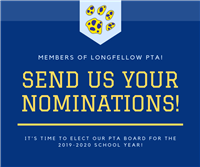 Take a look at the latest PTA Newsletter! Click here to download our latest PTA Newsletter in PDF format. Download the Longfellow App Today! DOWNLOAD TODAY! Push Notifications, Digital Thursday Folders, Grades (PSConnect), SchoolPay, Email the Teacher, Social Media, Directions to Longfellow, HISD News, and much more! Our school has raised $22,000 and counting! CLICK the title above to learn more about our APEX event! Regularly updated by our fifth grade writers. Click the title above to read the full story. Attending school every day is extremely important to the academic success of your child. This video explains HISD’s attendance policies and lets parents know where they can find information about school calendars and other important dates throughout the school year. Click here for more information. Check your child's grades from anywhere. Click here for more information. Social Media 101 for Parents! Did you know that the average child between 8 and 18 spends 53 hours a week on media and technology? Houston ISD has just launched an initiative to help you keep your child safe in a digital world. Click here to learn more. Parents, if you would like a copy of either of these two documents, they may be requested at our Front Office. Thank you! For more information about Longfellow Elementary and The Leader in Me™ process, please visit the HISD News Blog. These signed documents must be returned to the PTA Office Drop Box before students may attend.